MaxLite RR8 Series 8-Inch LED Commercial recessed retrofit downlight employs 30-Watt LED lamp with average life of 50000 hours to deliver light of brightness 2220 Lumens. LED Lamp has color rendering index of 80 and color temperature of 3000K. It has voltage rating of 120 - 277-Volts. 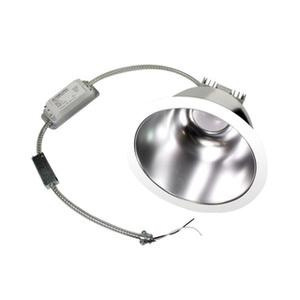 Dimmable downlight features heavy gauge anodized aluminum reflector in haze finish. It measures 7.93-Inch Dia x 5.56-Inch. Downlight mounts into the existing recessed frame. It is compatible with Lutron CTCL-153PD, DVCL-153PL, CTELV-303P, DVELV-303P, LGCL-153PL and Leviton IPI10 dimmers. 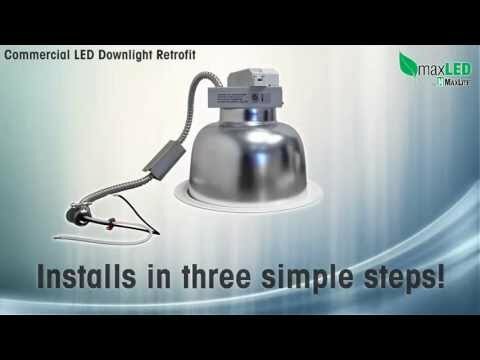 Downlight withstands operating temperature of 0 to 104 deg F. Downlight is cETLus listed and RoHS compliant.